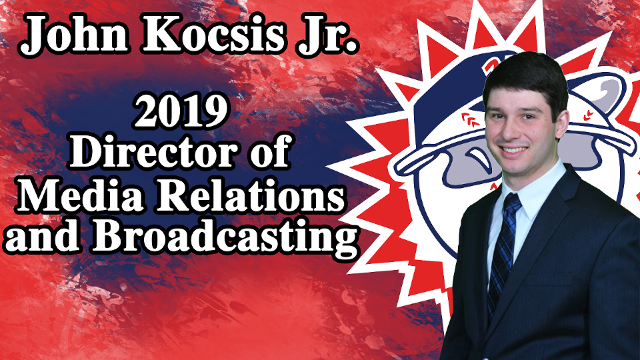 Kocsis Tabbed as New "Voice of the Suns"
HAGERSTOWN, MD (December 19, 2018) – The Hagerstown Suns will have a new Director of Media Relations/Broadcasting in 2019. John Kocsis Jr. will broadcast all 70 Suns home games from historic Municipal Stadium and select road games online via TuneIn Radio. The 24-year-old replaces Shawn Murnin, who is leaving to pursue other opportunities. Aside from broadcasting, Kocsis will also be the Suns’ new media relations contact. Kocsis joins the Suns after spending the last two seasons in the South Atlantic League with the West Virginia Power. The Cleveland, Ohio native joined West Virginia as a Video Production Intern in 2017 and became the Manager of In-Game Entertainment and Broadcast/Media Relations Assistant for the team in 2018. Prior to that, the Ohio University graduate was the Director of Broadcasting for the Southern Ohio Copperheads of the Great Lakes Summer Collegiate League in 2014 and 2015. In addition to his work in MiLB and collegiate baseball, Kocsis is the lead broadcaster for OhioVarsity.com and a broadcaster for collegiate football and basketball for the West Virginia Radio Corporation. Hagerstown’s 2019 home slate begins April 11 versus the Asheville Tourists. Be sure to listen to Suns home games online at hagerstownsuns.com. To purchase tickets or learn more about the Suns ticket plans for the 2019 season, call 301-791-6266 or visit www.hagerstownsuns.com.